The Windy City Plus Tour features four nights in a first class downtown Chicago hotel and one night in Milwaukee. Guests will catch games at Wrigley Field, Guaranteed Rate Field, and Miller Park. There will be plenty of time to explore Chicago with two free days built into the schedule. Like all Big League Tours, guests will sit in great seats and enjoy a Big League Player Experience. Join us! Book soon to hold your spot. 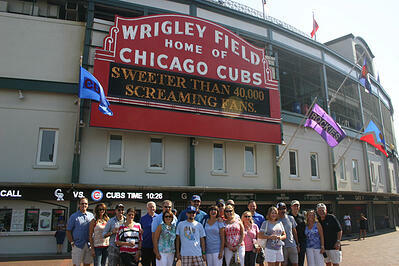 Big League Tours' guests just outside historic Wrigley Field.